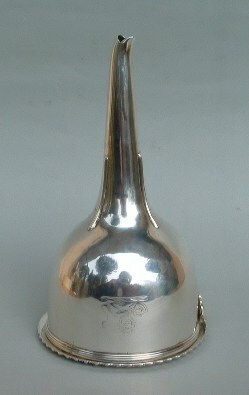 this Georgian silver wine funnel was made in London by silversmiths Rebecca Emes and Edward Barnard, circa 1815. 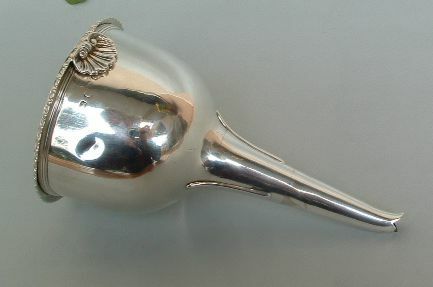 The wine funnel is in two parts, the bowl (strainer) and the main body with curved end of the spout. 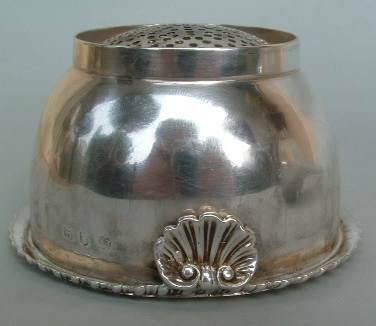 The bowl has gadrooned rim with a small shell on the side. 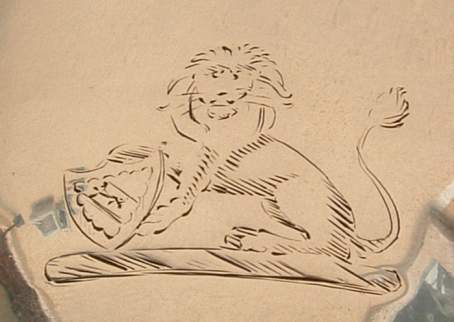 The body has an engraved family crest in the shape of a lion with shield. 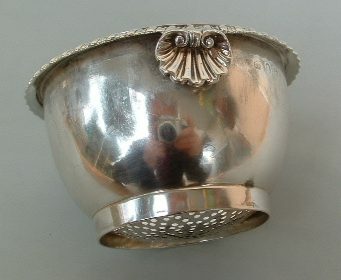 The bowl is hallmarked RE over EB (silversmiths), duty mark (George III) and lion passant (sterling silver). The body is hallmaked lion passant, leopard's head crowned (London) and duty mark, while date letter is rubbed. Rebecca Emes, is presumed to be the widow of John Emes (partner to Henry Chawner). 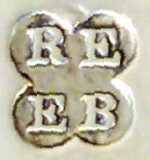 She registered its first hallmark with Edward Barnard in 1808 and was active until c. 1829. The firm was undoubtedly one of the largest working of Regency Period and had wide connections in the trade. 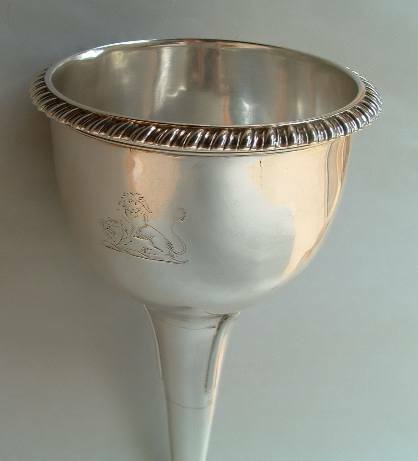 They were suppliers of plates to the Royal Goldsmiths, Rundell, Bridge and Rundell (the same firm that retailed Paul Storr's silver), to Cattle and Barber in York with race cups and were firm favourites with the English community in India who only bought top quality silver of good gauge. 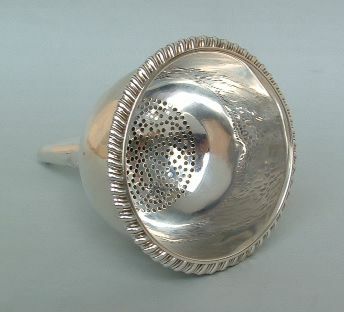 Wine funnels, also called wine strainers, were used to decant to the bottle and from the bottle to the decanter. 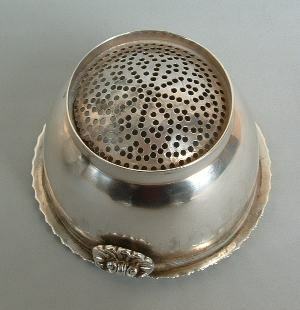 Most funnels are circular and either in one piece, with a removable pierced strainer, or in two pieces, comprising a pierced bowl and a body to contain it or a removable spout to apply to the strainer. Alternatively the bowl may include a removable inner ring to retain a muslin straining cloth. 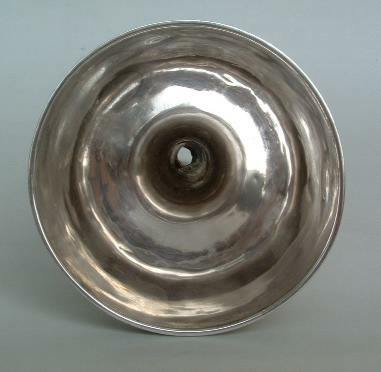 Most wine funnels date from between 1770 and 1820. 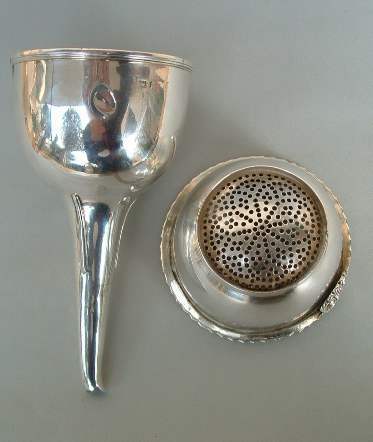 Examples of wine funnels made in the 1770s and 1780s are usually plain or have a reeded rim while later wine funnels are more elaborately decorated and have wider applied foliate rims. 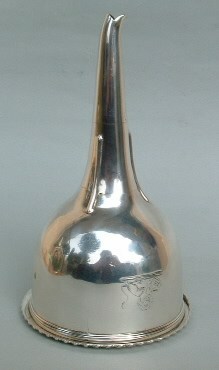 The end of the spout is usually curved so that the wine would flow down the side of the bottle to prevent aeration. Sometimes they had a stand with domed centre and short legs. The interior of the bowl was sometimes gilded. This wine funnel is 5 in. high (cm. 12,5) and was bought from an Italian dealer.